Avik Chanda, Suman Ghose, "From Command To Empathy: Using EQ In The Age Of Disruption"
In a world characterized by globalization and rapidly evolving technology, change is a given. The primary workforce is evolving and is now dominated by millennials who seek purpose and empathy - a phenomenon the top management grapples with. Most employers' understanding of this change is restricted, leading to most of the techniques used to address issues being in step with advances in process but overlooking the human element. Can an empathetic approach to our relationships at the workplace help us achieve more? Does the onus of creating and sustaining a supportive culture lie only with the top management? There is an urgent need to move away from traditional command-centred style of management towards an organizational culture that is inclusive, fosters trust and focuses on employee empowerment. 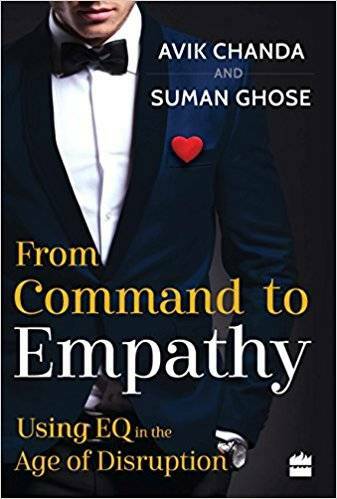 From Command to Empathy addresses the tussle between the management and the employees, and investigates the reasons behind them through anecdotes, case studies, questionnaires and self-scoring exercises. Avik Chanda and Suman Ghose draw from real-life examples and their deep industry experience, and research on organizational behaviour and neuroscience, to arrive at practical tips on how to inculcate and use emotional maturity in workplace situations to help readers achieve both professional and personal goals.